The Banana Pudding recipe you'll find here makes the best banana pudding I have ever tasted. I'll admit that statement qualifies the title of the article, but I'll bet it's the best banana pudding you've ever tasted, too. Banana pudding is not currently a fashionable dessert. You never see it served in "good" restaurants. And when it is found in a restaurant, more than likely it's a dollop of instant banana-flavored pudding with a vanilla wafer stuck in it and a dab of non-dairy whipped topping. Perhaps banana pudding gets no respect because of the vanilla wafers. It's likely that vanilla wafers, being ordinary cookies in the familiar yellow box found in stores everywhere, are regarded as pedestrian among gourmets. Of course, your trendy tiramisu, which uses packaged lady fingers as a base, gets away with it. When I began thinking about writing this article, I started wondering about the origins of this wonderful dessert. I wondered if banana pudding existed before vanilla wafers and, if that is the case, when did vanilla wafers get their start? And is banana pudding a southern dessert? And if so, why, because good bananas are available everywhere year-round. But there need not be so many questions here. Banana pudding merely lacks glamour, because it certainly doesn't lack anything else you would want in a dessert. Is it easy to make? Yes, it is. Well, you have to do a little more than boil water, but it's definitely not difficult to make. It's wonderful warm from the oven or cold from the refrigerator. It requires no exotic ingredients, other than the bananas which, when you think about it, really are pretty exotic. Banana pudding may be the original comfort food. The key to great banana pudding is ripe bananas. In fact, they should be very ripe. Yellow with little brown specks. Bananas ripen best in the dark, so put them in a paper bag and check on them until they're perfect. They ripen every bit as well when they're in the refrigerator, too, assuming it's dark in your refrigerator. Place in a preheated 375°F oven and bake until browned, 12 to 15 minutes, depending upon your oven. Makes 8 servings. This recipe makes enough banana pudding to fill a 9 x 13 inch baking dish, which feeds a lot more people. Make this and take it to a cook-out. Your dish will bring you lots of attention. Line the bottom of a 9" x 13" baking dish with a layer of vanilla wafers. This recipe will not use the whole box, so you may snack, but don't get carried away. In a heavy saucepan, beat the egg yolks well (just use a fork or whisk, but beat them well). Over medium heat, add the flour mixture to the egg yolks, alternately with the milk and vanilla, stirring constantly. Bring to a gentle boil and, when the mixture begins to thicken, add the butter, continuing to stir. Keep boiling and stirring until mixture reaches a nice pudding consistency. [Note: If you're working with an electric cooktop, adjust the heat so that it's hot enough to boil, but not so hot that the pudding scorches.] Remove from heat. Place a layer of banana slices in the baking dish on top of the vanilla wafers. Don't stint and put one slice of banana per wafer. Line those banana slices up edge-to-edge. Pour, spreading as necessary, half of the pudding over the banana layer. Put down another layer of vanilla wafers, another layer of banana slices, and cover with the remaining pudding. Bake in a preheated 375°F oven until meringue browns, 12 to 15 minutes, depending upon your oven. The size and shape of the baking dish are important. If you don't have a 9" x 9" baking dish, you really should. It's a handy size to have. You can get this baking dish from Amazon by clicking here. 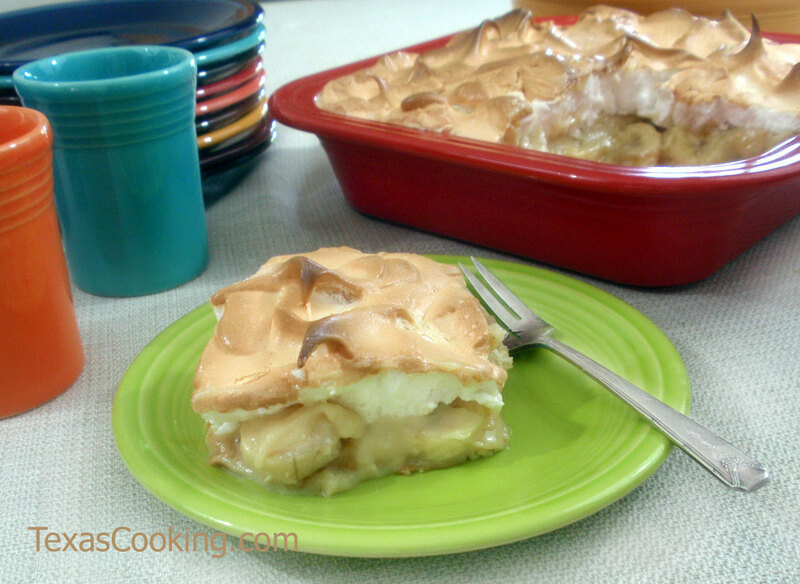 I've made this banana pudding in a round casserole dish, and it just doesn't turn out as well. Another thing to wonder about. This recipe makes 6 or 8 servings, and you can count on people asking for seconds. Any leftovers should be covered and refrigerated. And, yes, it's hard to cover anything with a meringue top and anyway, banana pudding is not as attractive after it has been refrigerated. But it's still just as delicious. Give this old favorite a try.